Our range of bespoke inset sinks is the ideal choice, whatever your installation. Each sink bowl can be supplied as a standard, prefabricated piece (with a choice of sizes), fully welded into the bespoke unit. For more specific requirements, choose a fully customised piece, including a handmade bowl from premium-grade steel, fabricated to the precise size and shape required. Whatever the setting, the metal offers a tough, impact-resistant surface, that is easy to clean and requires minimal maintenance. This ease of use makes it perfect for all environments – from commercial and domestic kitchens, school food technology rooms and hi-tech laboratories to GPs’ practices, hospitals, dental clinics, care homes and veterinary surgeries. Designed to be straightforward to fit into any worktop – from Trespa to stone, wood and laminate – and available in a variety of sizes, our rectangular sink units also come with a choice of regular and extra-large bowls. Please see the list below for some of the options available – or visit the relevant section of our website for your specific sector. units available in any length and width, at any depth up to 450mm. Stainless steel is the mandatory material for sinks in many laboratories, especially where sterility is vital. Even where there is no ruling as to sink composition, we have found our stainless-steel inset sinks to be tougher and more corrosion-resistant than the equivalent sinks in epoxy resin – which have been known to crack when exposed to liquid nitrogen, for example. Our high-quality steel is also exceedingly durable, lasting for decades – making it the cost-effective option for your laboratory. 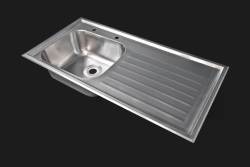 All of our inset sinks are fabricated in our workshop from premium-quality, laboratory-grade (316) steel, which is impact- and stain-resistant and can withstand corrosive chemicals as well as high temperatures. acid-resistant un-slotted polypropylene waste with upstand waste and overflow tube. We can also adjust tap placement for larger sink bowls, adding a side ledge to maximise usable space within the bowl. All of our inset sinks are designed for easy installation into a bench top of any material. However, to take advantage of the full antibacterial advantages of the steel, we recommend welding into a stainless-steel bench top, thus avoiding obvious joins in which germs can gather. Stainless steel is the only material which allows this super-hygienic, seamless finish. Please take a look at our range of worktops – all as customisable as our inset sink units. We also fabricate fume cupboard liners, splashbacks, sink bowls, hand-wash basins, shower trays, cupboards and shelves, trolleys and tables. Feel free to browse our range of products on this site, or simply get in touch with us, to discuss your project. Even if you don’t see what you need here, we can fabricate most products to our clients’ specifications. Thanks to its inbuilt antibacterial properties, stainless steel is the prescribed material for sinks in many healthcare environments, where sterility is vital. Meeting all current Health & Safety and Food Hygiene regulations, the steel’s smooth surface is easy to clean, low-maintenance, heat- and impact-resistant, and extremely durable. The sheer longevity of the material makes it the economically-sound choice for your project. positioning of tap ledge and holes – including side ledge, if preferred, to maximise bowl size. 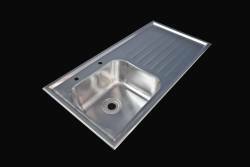 Our inset sinks are supplied with integral clips, for easy fitting to a cut-out in a worktop composed of any material. For maximum hygiene efficacy, consider having a sink integrated into one of our premium-quality worktops, which are also available in a choice of 304 food-grade and 316 laboratory-grade steel. 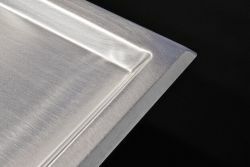 The fully-welded end-product boasts a seamless surface, leaving no joins in which bacteria can breed. No other material offers this high-hygiene finish. Our range of bespoke steel products includes many other options for your healthcare setting – from shower trays, security sinks, hand-wash basins and splashbacks to cupboards and shelves. Get in touch today, to discuss the specific requirements for your project. Whether you are outfitting a food technology room, a school kitchen, a laboratory or a childcare centre, you need a sink that will last for years and will stand up to even the most demanding of environments. Our premium-quality, stainless-steel inset sinks are made from food-grade steel, which meets all current Health & Safety and Food Hygiene regulations – making it particularly suitable for use in an educational establishment or kitchen. This tough metal is also resistant to extremes of heat, making it the ideal choice for most environments. For laboratories, we recommend our ‘316’, laboratory-grade steel sinks, which also offer high resistance to corrosive chemicals. 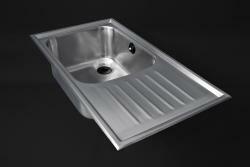 All of our inset sinks are bespoke, created by our engineers to our customers’ specifications. This means that we can produce any size or shape of sink, for your fitters to slot neatly into a cut-out in any work surface. The sink unit features integral clips, making it for straightforward to secure to the worktop. where vandalism is a concern, or small children are present, we can fabricate a security sink unit, whereby a plinth fixed beneath the sink unit prevents access. We can also incorporate the inset sink into a larger design scheme, such as a stainless-steel worktop, whereby the sink will be fully welded to the work surface, dispensing with visible joins where bacteria and dust can accumulate. No other worktop material allows this seamless finish, which is vital in a high-hygiene area, such as a laboratory or areas where food is prepared. As well as inset sinks and worktops, we offer splashbacks, shower trays, trolleys and tables, cupboards and shelves. We can create whatever stainless-steel products you need to furnish your project – get in touch today, to discuss your requirements. Complying to all current Health & Safety and Food Hygiene standards, our stainless-steel inset sinks are impact resistant and will also withstand extremes of heat, making them the obvious choice for your commercial kitchen. Featuring greater stain-resistance and durability than ceramic, they are ideal for a catering environment, where high usage dictates the need for a truly robust product. choice of waste type and siting. All of our sinks feature water-retaining edging and come complete with adjustable fixing clips, for straightforward installation into a worktop made from any material. For the highest-quality finish, choose an integrated worktop, from our wide range; all are fully customisable. This all-in-one unit will provide a seamless surface, with no joins in which bacteria and food crumbs can accumulate. We offer a wide range of prefabricated bowls in varying sizes, all of which will be fully welded into the made-to-measure sink unit. Alternatively, for a fully-bespoke sink, opt for a handmade bowl, fabricated from our highest-quality steel. This is the long-term, cost-effective choice for your budget, as your stainless steel sink will outlast all other materials. At DSM, we offer a wide range of stainless-steel products, including: worktops, shelving, cupboards, shower trays, vanity tops, urinals, plinths and hand-wash basins. Contact us today, to discuss the requirements for your project. With their gleaming finish and antibacterial surface, our stainless-steel inset sinks are ideally suited for use in washrooms. Robust, impact-proof and easy to clean, the stain-resistant material doesn’t crack like ceramic. What’s more, it complies with all current Health & Safety and Food Hygiene standards. choice of siting of taps and waste holes. All of our inset sinks come complete with adjustable fixing clips, for straightforward installation into a worktop of any material. For premium results, consider having your sink fully integrated into one of our premium steel worktops – or you could opt for a row of sinks, within a high-specification vanity top. 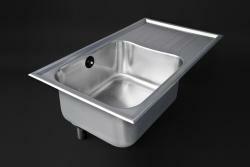 As well as sinks, we fabricate a wide range of high-quality, stainless-steel products. Visit the relevant sections of our site to find out more about our worktops, shelving, cupboards, shower trays, vanity tops, urinals and more. We can also fabricate pieces from your own designs. Give us a call or email today, for more information about our services. For a truly contemporary finish to your kitchen or bathroom, you’ll need a gleaming, stainless-steel inset sink. Our bespoke sinks will lend a luxurious impression to your room, adding a reflective focal point to your kitchen work surface or bathroom installation. Fabricated from food-grade steel, which is heat- and impact-resistant, our wipe-clean sinks will last for decades with the minimum of maintenance. Designed for easy fitting, our sinks simply slot from above, into a cut-out in a worktop made from any material, whether you opt for glossy granite, solid wood or laminate. However, for the ultimate in streamlined chic, choose a stainless-steel worktop: thanks to the welding of the metal, this is the only material that will provide a seamless finish between the sink and work surface, leaving no joins in which food crumbs and bacteria can gather. standard curved or bespoke box-style corners. If you have very precise design demands, please give us a call. We offer many different options, including replacing the prefabricated bowl with one made in our factory, from premium-grade steel. This option allows you to specify the exact shape and size of your bowl and unit. 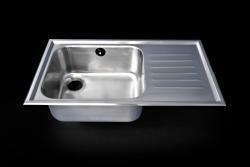 Because we use only the highest-quality metal for our bespoke bowls, your sink unit will last for decades. We fabricate many other stainless-steel products, all of which would complement the modern home. From entire kitchens to worktops, shelving, cupboards, shower trays, vanity tops, urinals, we can fabricate and supply exactly what you need. Give us a call or email today, for more information and to discuss your home installation. The metal in our bespoke stainless-steel inset sinks is naturally antibacterial and meets all current Health & Safety and Food Hygiene regulations – making it the perfect choice to maintain the stringent hygiene standards of a veterinary practice. Because we fabricate each sink unit in-house, we can provide the exact product you need, to your specifications. 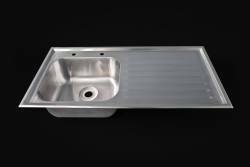 Our sinks are fitted with a prefabricated bowl as standard. However, because we understand that some veterinary practices have to cater for the very specific needs of certain types of animal, we can fabricate a bespoke bowl to your exact requirement, be that extra-large or -small or an unusual shape. We understand that your practice has to be built around the specific needs of your patients. That’s why we offer a fully bespoke service, to build the exact products you require to furnish your clinic. 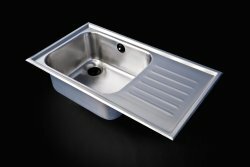 As well as sinks, we can fabricate any product to your specifications, from a set of steps leading up to the examination bench (ideal for heavier patients, such as large dogs) to a shower tray, worktops, an examination table, lockable storage units for storing medication and surgical implements, and an under-sink plinth, to prevent access by small animals. Get in touch today, to discuss the needs for your veterinary practice.